LEDs are the standard light source in car cockpits. It is not sufficient to find out if a LED shines, or not. The LED needs to have precisely the specified brightness and color to fulfil its function. 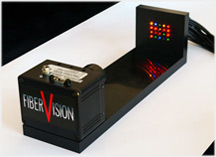 The FiberVision LED-Check system tests up to 250 LEDs in less than one second. Usually, the LEDs are spread all over the electronic board. Their distance to each other is pretty large. An optical glass fiber is placed above each LED to collect the light. The fibers are placed close to each other in a fixed grid on the LED-Check side. These light spots enable precise evaluation and simple configuration. The core of LED-Check is a digital 1.4 megapixel camera with a FireWire 1394A interface. Its 2/3“ CCD chip combines high light sensitivity with low noise. The LED-Check software is designed for Windows 2000 and XP. The LED-Check software can be integrated into own test applications using a DLL (Dynamic Link Library). The serial (RS232) or Ethernet (TCPIP) data exchange enables to make LED-Check available to Unix or Linux systems.